Are you tinkering or transforming? The need for change in organisations and sectors all over the world created a whole field of expertise and a category of employee - The Change Manager, the Change Leader, the Change Consultant. They live and breathe this stuff; they know what it’s about, how to do it and the impact a change initiative can have on people and the way organisations operate. They’re all about helping us get from here … to there. Yet some change leaders don’t just deal with change anymore, they deal with even bigger stuff … transformation. Yes, change has grown bigger and become even more chang-ey; change that is more significant and more widespread and interconnected and ongoing is transformation. In one of my earlier careers as an awards judge for communication projects, the panel would review submissions where entrants would declare that their goals were to ‘change the community’s perception of….’ or ‘change the customer’s behaviour’ or ‘change the way that…’- yet few of these declarations of change seemed to also declare by what amount or percent or scale they would change, to make or become different. It seemed that a little bit of change was still change and for many in the field, that was enough. Tick. Done. Change has occurred. Next project! Change often seems to have a defined and finite scope. But to transform is something else. It's often seen as something different. Is transformation a change you can see? Is it obvious, noticeable, significant, ongoing and interconnected? Could you perhaps keep track of it or mark it on something: “A year ago we were there, last month we were there and now ...we are here! Look! Transformation." Do you remember the pencil marks on the kitchen wall? As you grew in height you could see that transformation had occurred, and a marked change had taken place. You might have done this for your own kids, or pets or plants or even your unread book collection. Transformation is change. But I fear that while we're all so involved and committed to a piece of change, it’s actually just … a tinkering. A tinkerer was somewhat of a gypsy; they’d travel from place to place and make a living by fixing and mending metal pots and pans and tools. The noise was a ‘tinker’. You can hear it - when someone is working on an old car under the hood, or they are rattling around in the utensils drawer in the kitchen looking for a potato masher or a pot lid or the spoon that completes that set of salad servers. Rattle rattle clank clang and tinker. Yes that noise. Tinkering was about improving, to try to mend, to fix it up or improve. A little. Of all the effort that goes into change and transformation programs in workplaces, this is what I see: lots of effort. To improve. Hours and days, weeks and months of time and effort. So many meetings, information packs, version control of the information packs, flow charts and arrows, more meetings, working groups, town halls and whole-of-staff gatherings, more meetings and presentations and packs. But not enough of decisions, actions, experiments and results. As a recent Harvard Business Review suggested, many of our changes aren’t ambitious enough. Many changes or shifts are too delicate, bite size - just a morsel or a crumb. The end result : tinkering. Little changes. Petit. Picolo. Over a l-o-n-g period of time. We’re not really changing that much... are we? We might be aiming to change a lot of processes or systems and structures, or hell yes, let’s change people, even just a few degrees would be great. And yet that is hard work. To get everyone - all of them - to shift. A little. All the teams, units and departments to all shift one or two degrees. That’s a big deal. Rather than tinkering on a little something with everyone, why not look at how you can truly transform a pocket, a division, a team, a squad or a unit. And dramatically. Markedly. Internal hubs, accelerators and pockets of innovative joy are popping up everywhere in cities, communities and businesses. Some companies are setting them up off-site in a cool warehouse-style environment, others are cordoning off a meeting room and labelling it ‘The Innovation Lab’ or ‘hub’ or ‘foundry’ or ‘garage’ or other mechanical-workshoppy-sounding noun where things are being furiously made. Whatever you call your transformation pocket - and your business doesn’t need to be large to do this - be sure that you actually transform something... rather than tinkering with everything. Start there. Do you major in minor or minor in major? Jim Rohn’s advice to avoid ‘majoring in minor things’ perhaps suggests we could avoid the large, unweildy and lengthy change we're trying to make to somethin' little. That can turn out to be a big mess. There is a more helpful (diagonal) opposite. It’s smarter, more lean and more agile to start with ‘minoring in major things’. That is, carry out little experiments on some of the bigger things. Then you can move step by step towards the big deal of majoring on those major transformative things. Too often the default change initiative is majoring in the minor. I think you need to keep a look out, and then get outta there. So go ahead and 'have a crack' at radically changing something. This is where transformation is born. This is where success and learned failure live. It's way more experimental, experiential and insightful. With some experiments launched, you can see how they go. Then you can experiment faster, and get results faster and these will be results that are noticeable and reportable, applicable ... formidable. You'll be playing a leaner game (a-la The Lean Start-up) with yes, perhaps a low-fidelity version of that something, but with insights and data that pour back to you way sooner than a long drawn-out change effort involving a cast of many and a calendar of many months... or years. This approach schools us so the next one we launch - if it turns out that it’s actually worth launching another one or "rolling" anything out to anyone - will be more efficient, more valuable and simply work better. Leave those little barely-there ‘just noticeable differences’ for the marketing world and their product packaging on supermarket shelves. They don't belong in change and transformation. Don’t fall into the safety of a too subtle, too gentle or too soft change - it keeps you busy but... it will do that for years. Yawn! Too many people, projects, teams, units, industries and organisations are tinkering. You can keep tapping away on a little bit of metal somewhere - tinker tinker - gently and fearfully at the edges of what could be great, hoping to make a few indents ... or you can melt the thing down, change it markedly (transform it) and see what new there is to work with. It’s minoring in major things, in transforming some. This will help get you ready for bigger transformations up ahead. This is marked change and this is the type of transformation the world requires us to make today. 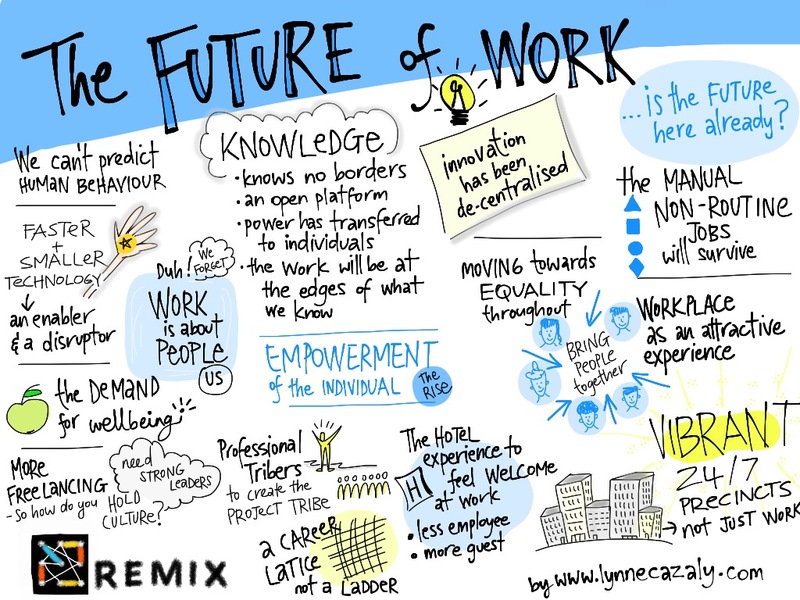 Do you know what the future of work will look like? Can you imagine the effects of teaching computers to understand? It's happening now... not just thinking computers but understanding computers. What will that mean for the future of our work? At the REMIX Summit in Sydney recently, the focus was on the future and the intersection of technology, culture and entrepreneurship. There will be more freelancing - so how do you hold a culture together in that type of environment? We'll need to be stronger leaders. Fast, small technology is proving to be both an enabler and a disruptor. Look at that 'smart' phone you've got there and what its capable of. Despite us not being able to exactly predict human behaviour, we've got to remember that work is about us... it's about people... humans. A great deal of our work is knowledge work and knowledge knows no borders. In the future, you'll see your career as a lattice... not a ladder. Careers, opportunities, jobs, roles and pathways will criss cross and complement; they won't be straight up and down. Workplaces will need to be more attractive experiences that bring people together, evolving into vibrant 24/7 precincts that aren't just about work. Pass me my bathrobe please! One of the Remix Summit speakers suggested the 'hotel experience' would come to workplaces, where we feel welcome at work, where we are less of an employee and more of a guest. What does the future of work mean for leaders leading in these environments that are uncertain, changing and complex? Leaders will need to be sense makers... everyday. At the heart of it, leaders will need to make quicker and clearer sense of things, for themselves, the people they lead and for others they interact with. They'll need to engage across even more diverse interests and cultures and they'll need to be aligning and realigning their teams to the strategic shifts that become constant and frequent. For some more detailed reading pleasure, CEDA the Committee for Economic Development here in Australia released their Australia's Future Workforce Report today and you can get hold of it here. How will you keep adapting for the future of work? How will you keep the team connected, the culture thriving, the workplace adapting and the competition afraid of your bold responses? The work of the future will be at the edges of what we know. Keep looking, learning and pushing the edges of your work. You're gonna need it for the future. How involved do you want people to be? When you next need to get input or contributions from people, or you need to consult with a team on something, think first: how involved do you want people to be? This really is the question - just how deeply involved? It can get messy if you think one thing and they think another. This quick video outlines a depth of involvement and participation. Go on, get into it. 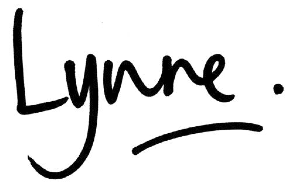 How to engage people in change & transformation from Lynne Cazaly on Vimeo. When change is on the agenda - and it so often is in today's workplaces - be sure you've got engaging tools to help people buy into the change and transformation that's coming. Avoid ambiguity and complication. Hey, you might love working down in the detail because you're involved in the piece of work, but that doesn't mean others across the organisation are that 'into' you or the change! Check out this week's sketch video to move beyond a 'pack' of information! To lead organisations through significant change and transformation, you need broader and deeper thinking, and use more than emotion alone - so said Hans-Ulrich Maerki, former Chairman and General Manager of IBM in Europe. He gave a presentation last week on how to lead transformative change. He also referred to the book of Louise V Gerstner Jnr, former IBM Chairman and CEO : 'Who says elephants can't dance' which details how the fortunes of IBM were turned around. Above all he asked 'how closely are we living up to the values' of the organisation. My visualisation of his 20 minute presentation is this week's sip of information distilled from a presentation.